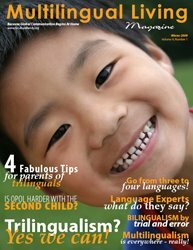 Whew, the March-April issue of Multilingual Living Magazine is out! It took an "all-nighter" and a final completion at 5:00 AM on March 2nd to get accomplished but sometimes that is just what it takes. (The photo above, taken the morning after publication, shows where I do my part of the magazine work.) The only unfortunate part was that this didn't give Alice enough time to do her final editing magic, and I was too sleep deprived to do a good enough job in this area. Thus, a million and one editing errors made it into the magazine. Please forgive this unprofessionalism and check back in a day or two for the newly updated version with errors fixed. When this happens, I feel like a total failure. I reprimand myself for being so unprofessional and swear that next time I will do better. Alice and I convene to discuss how we can be more efficient (between loads of laundry), more streamlined (while kids are screaming in the other room) and more professional (while dinner is boiling over on the stove). I guess it is just a lot of work for two women who do this all on their own free time for absolutely no pay. I'm not sure how many people know that Alice and I do the magazine purely as a volunteer effort. None of the subscription or advertising dollars go to either of us. Those dollars go to pay for the website servers, the post office box, the photos we may need to purchase for the magazine, software to create the magazine, and anything else needed to keep the website and magazine going. We do not have enough paying subscribers and advertisers to do more than simply cover expenses and we only have a little extra in the account for unforseen expenses. We dream constantly about how this will change in the future but for now, Alice and I stay up late into the night and plan during trips to the supermarket to make Multilingual Living Magazine a reality. Of course, we couldn't do it without the fabulous submissions from people around the world, who are also volunteering their time and their gift of the written word. And each of you who are subscribers, have donated your time and money, and who are sponsors are making this all possible! I have to admit, there are times when I just want to throw in the towel. After working a 10-hour day at my paying job (totally unrelated to magazine production or website creation or publications in any way shape or form), reading books with the kids, getting dinner on the table, brushing teeth, getting kids to bed, the last thing I want to do is work on Multilingual Living Magazine. My husband and I sometimes find ourselves passing in the hall like roommates in a college dorm with term papers due, complete lost in other thoughts. He in his office grading papers and I at my desk or the kitchen table with my little laptop doing the magazine. I cross my fingers that the kids will stay asleep. Or during the day, that the kids will stay focused on their activities long enough to give me the time to accomplish a few pieces of the magazine. As in the photo above, as I work on the magazine, often the kids create their wooden train world or some other construction project or even homeschooling activities. We all sit at the table and "work" away. At these moments, I ask myself... for whom am I doing this? Does anyone really appreciate it? And if they don't, would I do it anyway? Why do I spend hours on this when I may never see any financial return? When those moments happen, I often stop everything and start reading through your articles, and essays and columns again. I let myself savor the beauty of your words and images. I let them speak through me... your words spoken with my own voice. You understand what a multilingual life is all about, what a multicultural life entails. You appreciate the intricacies and complexities inherent in being uprooted and bare, groping for an identity which is all your own. You know what it means to be different, to be considered strange and perhaps a little odd. It takes courage and contemplation to write for Multilingual Living Magazine. You contributors must dig deep into your psyches to put to words unique and personal thoughts and emotions. Or, at the very least, you must be able to put complex ideas and concepts into words that the non-expert can understand, yet without a kind of empty simplicity intended for the disinterested masses. This is no easy task. So, when I feel completely empty and exhausted and want to throw in the towel, I am reminded of why Alice and I do this, why you contributors do this, why you subscribers take the time to pay your $12 a year. It may mean staying up all night every now and then and I may turn into a sleep-deprived, cranky woman the next day and my husband and friends may need to remind me that it is all worth it... but sometimes that is just the small price we pay for our dreams. You've done a phenomenal job, Corey!! Whatever mistakes we made in the process I think they are little ones, and I am sure that our readers will understand if everything doesn't turn out to be 110% perfect, given the fact that we're trying to handle motherhood, job, household chores, bouts of illness, fatigue and surgery at the same time as well. Putting a magazine together is no piece of cake. I think that many people in our situation would've given up by now, latest after the second issue. But not Corey, no!!! You hang on to your passion and hang on to it when things get tough. This means that you are truly working one something that you care very deeply about. We can feel and see that, you know!! What counts is that this magazine is an absolute gem, and it's a true joy to browse through it. I also want to blog on "Why I do this" (GREAT topic!!) - not right now, though. Your entry is really touching, Corey. Your dedication to Multilingual things is unquestionable. Rest assure that more and more people will contribute and your dream to put the magazine in print will come true .... actually lots of subcsribers share your dream :D. Keep up the good work!! Corey, I think it is amazing that you push through and produce this incredible magazine. Well done. You show the rest of us what can be done. Keep it up! Such an inspiring piece, Corey!Please continue...you should be in politics! You can inspire pople, do you realize that? 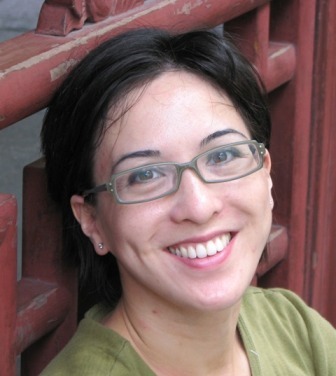 You have some innate leadership that emanates from your writing...and I never even met you! To the four of you... THANK YOU! I sometimes think I am going through one of my existential identity crises again. Trying to get back on track again. Not sure how I got off. Needing to remind myself (clearly through reminding others) to follow my heart and that it IS all worth it. When I read your comments, I feel so honored to be in your "community"! Thank you, thank you for taking the time to write. It is extremely appreciated and is helping to regenerate my soul!